Savvy homeowners today are paying more attention to the various factors that impact their indoor air quality, and with good reason – the air inside the average U.S. home is often far more polluted than the air outside. People are installing whole-house air cleaners and ventilation systems in their homes to remove airborne contaminants. Those kinds of improvements are certainly smart and effective, but one of the easiest ways you can clean up the air in your Sugar Land, Texas home, is by using a filter that is ideal for your HVAC system. Though it is often neglected, your filter is one of the most important components of your heating and cooling system, and one of the greatest tools for improving your indoor air quality. But not all filters are created equal. Learn more about these air cleaning devices, and get tips for selecting the best air filter for your needs. According to the U.S. Environmental Protection Agency, indoor air pollution is included in the list of top five environmental health risks. While source control (removing or reducing the source of pollution) and proper ventilation should be among the first steps you take to clean up your air, the weather or level of outdoor contaminants may hinder your ability to do so. It’s times like these that you should be able to rely on an effective air filter. The more dust and dirt particles a filter can remove from your air, the more efficient it is. 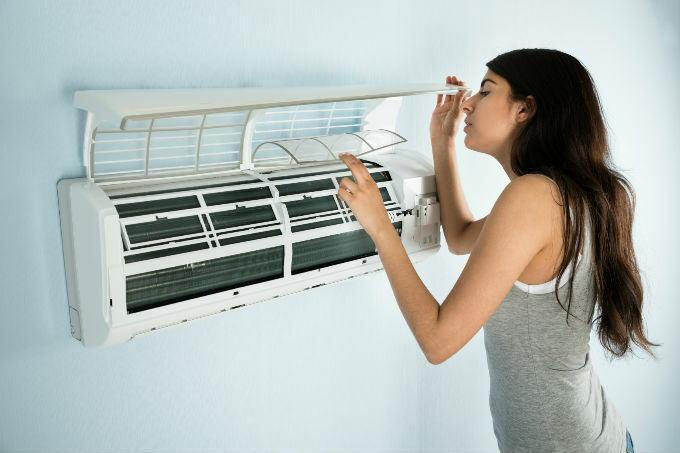 Inefficient types can’t do a good enough job of preventing particles from spreading throughout your air and settling on vital components of your HVAC system. This not only reduces your system’s ability to properly heat and cool your home, but it can increase the need for untimely repair jobs. How Efficient Should a Filter Be? Upgrading to a more efficient filter will most likely result in reduced energy costs, but that doesn’t necessarily mean you need one that is considered highly efficient. Sometimes high-efficiency filters are so efficient that they can restrict airflow and cause fan motor burn-out. The kind of filter you should choose is largely dependent on how your indoor air quality is impacting your family’s health as well as how appropriate it is for your particular HVAC system. Low efficiency: The standard fiberglass filters may be the cheapest, but they are the least effective by far. Their one-inch thick barrier is only able to stop about 10 percent of the particles that try to pass through them. Medium efficiency: Usually made from pleated, woven material, medium grade air filters can trap between 20 to 50 percent of tiny particles (between 0.3 to 10 microns in size). Medium efficiency filters are relatively inexpensive and are available in both washable and disposable models. High efficiency: Filters that remove 60 to 95 percent of particles are considered high efficiency. Their better filtration capabilities mean they usually cost more. They can also be found in both washable and disposable models. Examine your filter at least once a month to see if there is a lot of buildup of dust and dirt, especially during times of heavy use. Follow the manufacturer’s recommendations and be sure to change or clean your filters as needed. Be sure that the filter fits snugly in place to avoid air leakage through the sides, and to maximize its efficiency. To ensure you know exactly when to change your filter you can use an inexpensive pressure gauge. Maximum pressure drop is recommended by filter manufacturers. Alternatively, there are filters available that have a sensor that tells when you when replacement is required. Do you need more tips for selecting the best air filter for your needs? For this and other HVAC concerns, please feel free to contact Conditioned Air Mechanical HVAC Services at 281-201-0356.